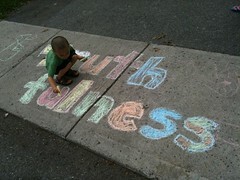 truthfulness | bahá'í children's class ideas! Truthfulness is a law that Bahá’u’lláh has established that the world may be united. We should tell the truth at all times, even if it is difficult. This way, we will be worthy of the trust of others. The Boy Who Cried Wolf. There is an excellent retelling in Book 2 of Bahá’í Education for Children, aka the Furútan curriculum. The story of Mullá Bahram, the honest merchant, from Ruhi Book 3. Tell the Truth. From Ruhi Book 3. Truthfulness. From Ruhi Book 3. Nine-pointed stars. Cut out three equilateral triangles for each child; help them put them together to form a regular nine-pointed star. They may either (1) place them on another piece of paper, trace them, and cut out the resulting nine-pointed star, or (2) glue the three triangles together to form a nine-pointed star. They can then decorate the star as they wish; they may also want to punch a hole in one point and run a string through to hang it somewhere when finished. Written exercise: Mulla Bahram’s story (PDF).